Members of Congress are required to annually file financial disclosure statements. So I put together some analysis examining the portfolios of the major players about which you asked. Members report their investment holdings by specifying a range of value (e.g. $15,001-$50,000; $50,001-$100,000, etc.) within which a given holding falls. Nancy Pelosi (D-CA) Speaker of the House. 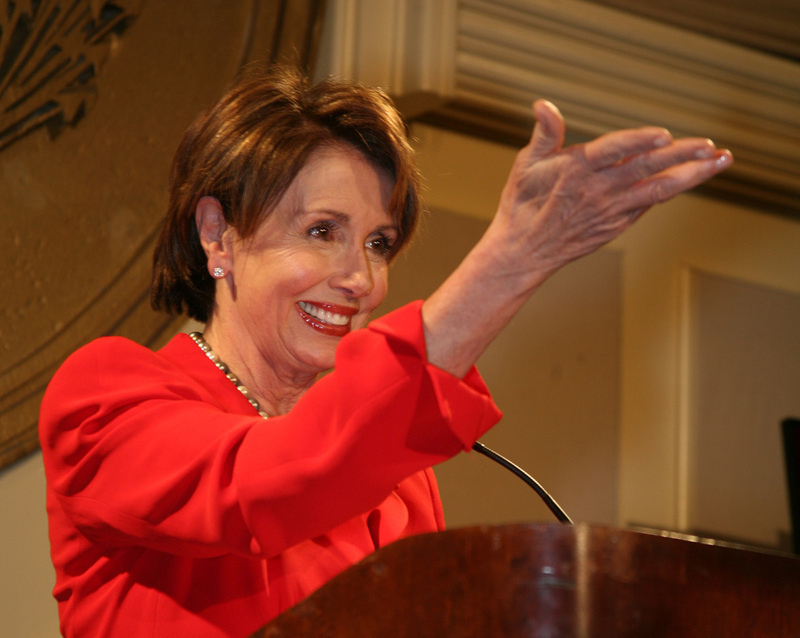 Of all the leaders in Congress, Pelosi by far has the largest net worth. She reports assets of about $96 million and of all the leaders has the most diverse portfolio comprising stocks, real estate and small business interests. Her largest holdings include $15 million each in Apple Inc, Cisco Systems, Commercial Property and Zinfandel Lane Vineyard. $3 million each in 723 Mule Ears Court/Norden, CA, Auberge du Soleil , Forty-Five Belden Corp, a Four-story commercial building, Nine Forty Five Battery LLC, Piatti Restaurant, Thirteen Hundred One Sansome LLC. She has liabilities totaling $33 million mostly on mortgages and lines of credit against real estate except $4 million borrowed on margin against securities brokerage accounts. John Boehner (R-OH) House Minority Leader. He has approximately $5 million invested and no liabilities. His biggest positions are $3 million in Nucite Sales (where he previously was company President), $200,000 each DWS Dreman High Return Equity Fund, Franklin Templeton Flex Cap Growth Fund, Keeley Small Cap Value Fund, $125,000 each in Fidelity Contrafund, Henderson International Opportunities, Munder Mid Cap Core Growth Fund and Vanguard Selected Value Fund. So, in addition to a large stake in his former employer's company, Boehner is invested in a diverse mix of stock mutual funds. Barney Frank (D-MA) Chairman of the House Committee on Financial Services. Frank has about $1.28 million invested almost exclusively in municipal bonds and he has no liabilities. Largest holdings are $500,000 in Massachusetts State Bonds, $250,000 in MA General Obligation State Bonds, $175,000 in Calvert Social Investment Fund. Of all the leaders profiled, I was puzzled why Frank relied on muni bonds and shunned the stock market and other growth vehicles. "Muni bonds are safe...and the Congressman is putting his money where he believes it will do the most good...helping local municipalities with needed infrastructure projects," according to his spokesperson. Harry Reid (D-NV) Senate Majority Leader. He has $4.5 million in assets, mostly real estate. His biggest holdings include $375,000 each in 160 acres of land, Elvira, Birdie, & Mesa Patented Claims, Patented Mining Claims in 75 ac. He has only about $100,000 in debt mostly a loan from his own professional corporation. Moments after the auto bailout package recently failed in the Senate, Reid said, "I dread looking at Wall Street tomorrow." Well, Reid won't feel the pain since he's loaded up on real estate. Mitch McConnell (R-KY) Senate Minority Leader. $6.96 million in assets mostly in stock mutual funds and a second home. Largest positions include $3 million in Vanguard Index 500 fund and a $2 million home with rental in Washington, DC. $175,000 each in T Rowe Price Mid Cap Growth Fund, Vanguard Capital Opportunity Fund, Vanguard Growth & Income Fund, and Vanguard Small Cap Value Index. He has a liability of $175,000 against his Washington, DC home. Chris Dodd (D-CT) Chairman of the U.S. Senate Banking Committee. He reports $1.55 million in assets mostly in individuals stocks focused in the health care sector. Biggest holdings include $125,000 each in Blockbuster Inc , Brookdale Senior Living Inc, Cardiome Pharma Corp, CME Group, Javelin Pharmaceuticals, and a cottage, $150,000 in the Senate Federal Credit Union. Liability of $175,000 against the cottage. In summary, with the exception of Barney Frank and Harry Reid, the Congressional leaders have diversified portfolios primarily focused on growth vehicles including stocks, real estate and small business - the three proven ways to build wealth. All of these ownership-oriented vehicles enable folks to share in long-term economic growth.